You never know what you're going to get with June. In fact, please don't ask me what the weather will be like! It'a all mixed up this year. It's been a dry year, the high season had such a long period with no rain, and so far the low season has not been very wet either. Sure there has been some rain, but a lot of nice sunny days too. I don't keep exact stats on hours of sunshine, but it certainly feels like the weather has been far too good for May. And now we're into June. To give you an idea of how random June can be ... in June 2009, we had just 50mm of rain. In June 2010, there was over 500mm of rain! First - coup news. Yes, there was a coup, officially on May 22nd the armed forces of Thailand took over running the country. No violence. International condemnation without really understanding the country. And let's be honest, it's a hard country to understand. I Tweeted a LOT on May 22nd and 23rd about the coup. The photo above was what happened to most TV channels for a couple of days. Current situation - in Phuket, 100% normal, no curfew of any kind, everything is totally normal, work, school, pay the bills, go for lunch, go shopping, go out on Friday night etc... If you read this and are thinking "Oh, coup, must be dangerous" think again. There is nothing at all to be worried about .. except the possibility of bad low season weather. May 23rd weather Tweet "Weather this morning, started damp, but now sunny. Radar shows some rain to the west"
(above) My boy helps to pressure clean the driveway... a good way to spend a damp Saturday. 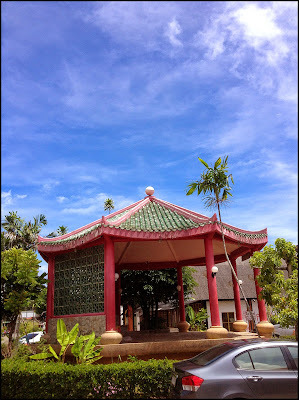 (above) Weather in Phuket Town, May 25th, you can see Dairy Hut restaurant, one of our favourite places for simple Thai food. 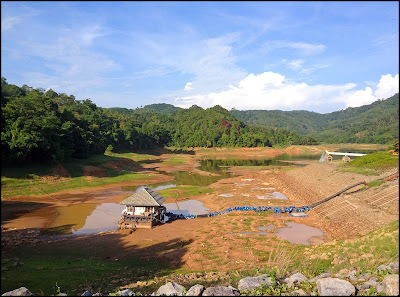 May 26th .. morning exercise on a sunny morning at Bang Wad Reservoir - it's very dry - see below. We need rain! It did p*ss down later on the 26th - check this video showing a timelapse from the Patong beach webcam. May 27th started clear and looked like another hot day on the way with perhaps afternoon rain, but there was rain sporadically during the day. May 28th "Lovely sunny day here in Phuket"
(above) Outside my workplace @ Sunrise Divers at Karon Beach on May 29th. Low season?? (above) in the morning at an exercise park not far from my house in Kathu, near Phuket Town. Nice weather again! May 31st "Today's weather in Phuket .. It's been hot. Some light rain and thunder early morning, but after that it was a humid oven!" June 1st "Phuket weather today - wet. It's been raining most of the day though I did manage my 6.5km morning walk at the reservoir without getting wet"
Yes, a wet one! When I was walking around the reservoir, I was sure that the rain would hit me, but somehow I stayed dry. 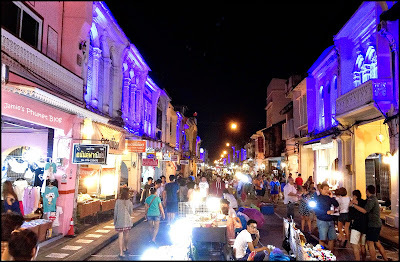 Later the rain stopped and we headed into town for the Sunday walking street market at Thalang Road. June 2nd "Today's weather in Phuket .. grey morning, sunny afternoon." June 3rd was a decent day with some evening rain. 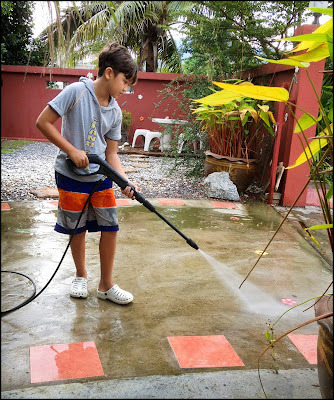 June 4th we finally got a "wet day" ... on Twitter I wrote "Phuket weather today : mostly wet. No really heavy rain, but rain falling almost all day so far." June 5th "Morning weather in Phuket : grey skies, maybe getting brighter"
June 6th "Another grey morning after a damp night." So it looked like low season weather might be on the way after a few days of "damp" weather, but in the last few days it's all gone sunny again. On June 7th we left Phuket for a few days, headed to Chumphon 400 km north for the weekend. 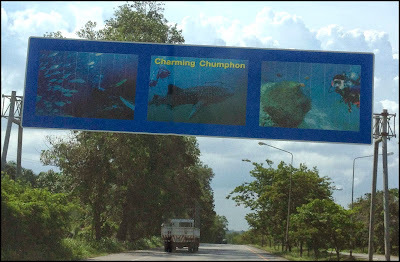 As you enter Chumphon province you have a sign to welcome you to "Charming Chumphon". And the weather was good. 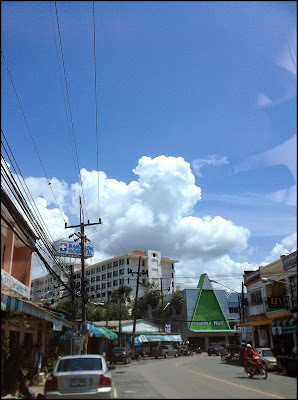 We came back to Phuket on Monday 9th in the afternoon, lovely and sunny in Phuket and in nearby Phang Nga Province too. 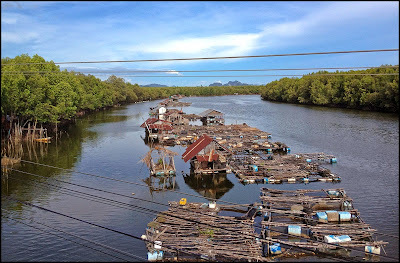 Above, view in Phang Nga as we drove over a bridge in the mangroves on June 9th.